[R]evolutionary technologies are rapidly making their way into the market, bringing with them greater precision, enhanced flexibility and — at least when compared to some conventional approaches — lower costs. The pace at which these new technologies, their tools and applications, are making their way out of the laboratory and into our hands appears to be accelerating. And while artificial intelligence, and gene editing tools such as the clustered regularly interspaced short palindromic repeats (CRISPR) system, appear to hold substantial promise, and unparalleled opportunities, great uncertainty exists over their trajectory and potential (unintended) risks. It is therefore not surprising that their development has been paralleled by calls to innovate responsibility, to assess the efficacy of currently legislative regimes, to integrate broader societal issues, and to actively engage the public on the trajectory that these technologies may, or may not, take. 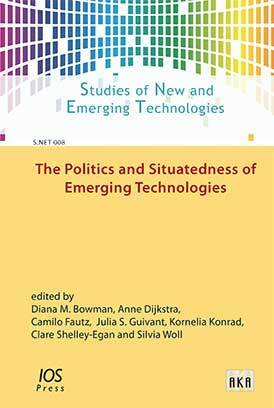 Bringing together contributions and perspectives from the multidisciplinary S.NET community, The Politics and Situatedness of Emerging Technologies critically examines dynamics that exists between politics, emerging technologies and the public. Collectively, the chapters illuminate the fundamental role of dialogue, politics, policy and governance frameworks in shaping, and embedding, all emerging technologies — and their products — into society.